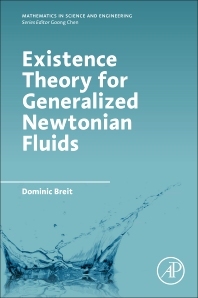 Existence Theory for Generalized Newtonian Fluids provides a rigorous mathematical treatment of the existence of weak solutions to generalized Navier-Stokes equations modeling Non-Newtonian fluid flows. The book presents classical results, developments over the last 50 years of research, and recent results with proofs. Dominic Breit is currently Assistant Professor in the Department of Mathematics at Heriot Watt University, Edinburgh. In 2009, Breit finished his PhD study at Saarland University in Saarbrücken (Germany). In 2014, he was awarded a price for the best habilitation thesis at LMU Munich for a thesis which is the basis for this book.